We are almost in the middle of 2018 and I decided to make a mid-year summary of my blogging income to see the overall direction and maybe do some corrections if needed to reach the best results by the end of the year. I believe that for most of you, reading this post, income reports are a great and free educational guideline that helps you see in which ways other bloggers make money. I recently published my record income report for May 2018 when I made almost $4000 from the two of my blogs. However, if I look at all the 6 months of the year, the income was not always at this level. The total income (before expenses and taxes) for the first 6 months of the year, is $15,355. Keep reading the post and you’ll know how exactly I made this money as a blogger. If you are reading this post and don’t know who I am and what my blogs are about, I’ll make this story short for you. I wanted to test my Pinterest strategies on a brand-new blog and see how fast I could grow traffic knowing all that I learned in the first year blogging. This worked perfectly well as in just 2.5 months my new blog was getting 74,000 monthly pageviews traffic. If you are about to start a blog and thinking, what should be your main focus for the first year – Google, Instagram, Facebook, paid ads (some newbies even think of this option!). My answer is: focus on Pinterest! 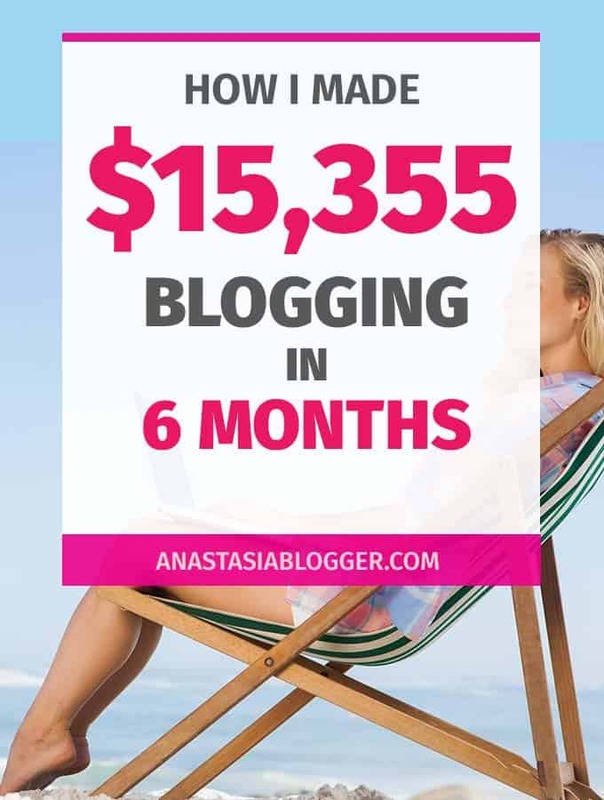 When you start a blog, most probably, you are still working full time, your blogging income is not high enough to quit, and you have a limited amount of time to spend on your blog. So, spend it wisely! Spend it on things that really works in 2018! I had to move to another hosting plan only 11 months since I started the blog because my traffic for January exceeded Bluehost’s basic plan about 10 times. But for a blog that’s just starting, Bluehost’s basic plan will be more than enough. Here is the income report with the total for the 2 blogs. Ad income (Mediavine) is still the main income source and it’s great because this proves that anyone can start a blog, reach 25,000 sessions/mo, apply to Mediavine and get monthly payments – no need to blog about blogging or sell your own products/courses from day one. In fact, if you don’t have traffic, who are going to sell your products to, right? You can focus on growing traffic for starters and monetize it with ads and affiliate links. Creating products is really time-consuming if you want to do it properly, I tried it myself and can tell you that if you have no audience yet, working on a product can end up with a big disappointment. You might spend months building a product, and when it’s ready – there is no one to buy. That can be too painful and turn you off of blogging. We don’t want that to happen, right? 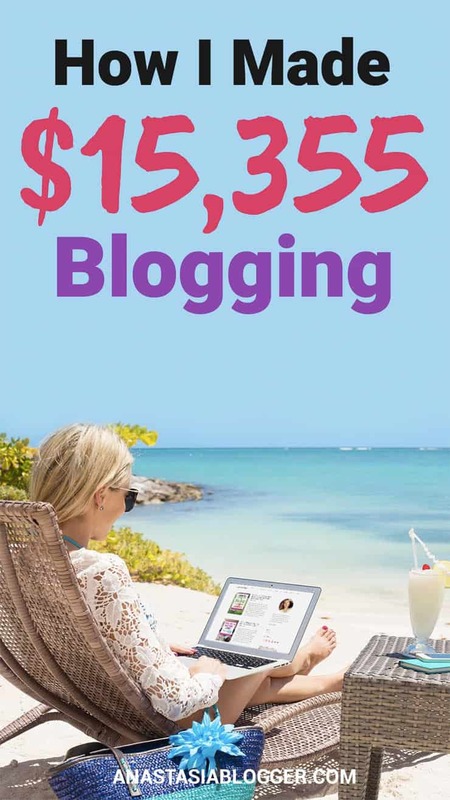 If you are looking for a proven blog growth and monetization formula, which will help you get your first $1000 in about 6 months blogging (possibly even earlier if you start with at least 20-50 pieces of content ready to publish). Grow traffic fast with a broadly niched blog writing about anything that is popular on Pinterest – DIY, recipes, holiday, moms and babies stuff, weight loss, diets, money saving and money making, etc.. Maybe not everything in one blog, but also possible. Reach 25,000 sessions a month to apply to Mediavine. You are getting there around $10-15 per 1000 sessions. On the best months (usually, it’s the last quarter of the year) this might reach even $20. With 30,000 sessions, you will make about $300-$600 a month from ads. With 90, 000 sessions you can make about $900 – $1200, depending on the season and your site’s metrics, because RPM varies even within the same niche. Add affiliate links and create more content with affiliate offers to have an extra income source. In some niches, affiliate income can be higher than ad income. Create a digital product, most probably, an eBook, but also could be something like a binder, a checklist, a troubleshooter, a mini-course by email or a webinar. I would start with a lower price range (up to $20) smaller product which doesn’t take too much time to create. This way I would test on a smaller product if in this niche people are ready to purchase digital products. I would choose which product it should be based on which topic seems to work the best on my broadly niched blog and what I can learn about fast to become an expert on that topic. See, my formula seems pretty simple. The question is, how do you implement all of this? Where do you get the traffic? From Pinterest! Currently, this is the fastest way to attract traffic to a new blog. So, focus on Pinterest SEO. So amazing! Awesome post! My main focus is Pinterest right now. I am still on the fence with ads..some say no ads others say a few is fine. I am testing ads on a few of my pins that can potentially generate higher conversions. Ads don’t hurt at all, especially if you’re trying to advertise something that has a lower chance to get an organic viral effect. Hello, I’ve followed you on Pinterest for a while now and re-pin some of you pins, you have excellent content! You mention Binder as possibly a digital product? could you explain this a little more or direct me to an example or possibly another post where you go into detail, Thank You.